One of the things for which Harry is remembered by those who worked with him is his perfectionism. Harry loved to tinker...constantly changing this and that melody, voice inflection, arrangement or lyric until he was satisfied...or time ran out! 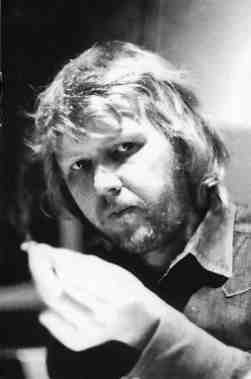 Nilsson fans I have met and spoken to in the last fe years fall into two distinct camps: those who prefer the remakes on 'APB' and those who prefer the original takes from the two albums which it is made up from. In fact Harry admitted in an interview that the re-workings he had tinkered with had varying levels of success...it didn't stop him tinkering, he did that just the same throughout his life! 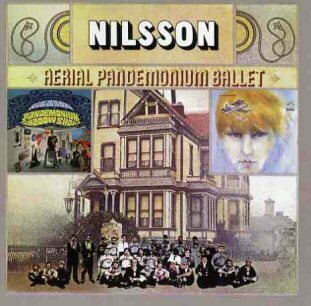 So, 'Aerial Pandemonium Ballet' is a compilation of the two LPs which make up its name. With more people having become aware of Harry via the success of 'Everybody's Talkin'' (and through 'Skidoo' and the 'Harry' album) it was deemed a good idea to re-release his first 2 albums so his new found fans could enjoy them. Harry was a little embarrassed by the 'dated' feel he felt they had...and so was born 'APB'. Much of the old 'signature brass' was dropped (or at least subdued) and vocals re-recorded with his less 'boyish' voice of the 70s. Strangely, I and many others feel that 'APB' has aged far less well than the two original albums over the ensuing 30 years or more. In fact, it was only after the Buddha/BMG re-release in 2000 that I began to listen to it again after a gap of well over a decade. This was something of an unusual inclusion on this album as it was always advertised as a compilation of the two earlier albums...yet this track had not appeared on either, except for the advance copies of 'AB' before being 'pulled' to avoid competition with 'The Monkees' version. Despite the original having not been heard a lot this version boasted new vocals and had the piano & guitar out of sync. This ensured (I am sure, unintentionally) that the first version instantly became a much sought after rarity! The harmony vocals were dropped and the overall production is less cluttered. The biggest, and most important, change here is the inclusion of the excerpt from 'One' as the 'one' hit the singer had had. This track was remixed and had new background vocals. Again remixed and slightly slowed down. You'd hardly notice unless you knew...so the question has to be asked...why? Few changes here...must some re-equalizing which makes it sound a little more 'naked' ...and, in my opinion, less finished. Reverb has been compromised as well. For this track Harry completely re-recorded the vocals, including changing the tune. Why????? Simply a remix. At least you can still hear Harry's 1967 vocal sound on this one. When Derek Taylor wrote in the liner notes to 'AB' that Harry did not frequent the whisky bars of the 'Strip' perhaps he did not envisage that he would do just that, and sooner rather than later! Harry and whisky seems to be the only 'raison d'etre' for this! If Harry was not drunk, why else would he crucify a great song by presenting it like this? Out of sync/time, and hacked to pieces! An absolute travesty...gosh, I'm SO glad I discovered Harry in proper, chronological order. This is appalling...again I have to ask why????? Why, in the name of Harry, WHY??????? (Did he seriously think this was an improvement???) Even the mind of a genius can be corrupted by the 'demon drink'!!! Mr Richland's favourite song, in its own right...do you know...this one song might, actually, have been improved by the 'APB' experience. I said MIGHT, you geddit??? The ending from the Aerial Ballet album. ...from the ashes of the last cut we arrive here, with one of the most sublime moments in re-issue/bonus track history! This is all Harry: vocals, piano and organ. Harry keeps all the simplicity and intimacy of Lennon's original but adds his own vocal superlative to produce a recording which would have graced any of his future solo albums. Absolutely beautiful. This is the earliest version of the song which has appeared as a Harry bonus track more than any other and which finally turned up on 'Son Of Schmilsson'. The song went through many incarnations from this to the final, tongue-in-cheek C&W version - though the spoken overdub here is particularly noticeable - how many songs feature the words 'lascivious conduct'? Although this was an early take of the song which would appear on 'Nilsson Schmilsson', in truth there are not too many changes between this and the final version. The vocals over the staccato organ chords is the same. The 'eatery' referred to in the song is probably New Orleans' 'Dooky Chase' - the lyric was changed in Ray Charles's version to 'Dooby' - a version of the sheet music for the song also has 'Dooby J's'. Harry obviously enjoyed playing around with this song and 'Cathy's Clown' once he discovered they fir together so well. He not only recorded this studio version but recorded a very funny video for a BBC studio concert in which he also added 'Let the Good Times Roll' to make a trio he could sing with himself! Overall, I'm extremely glad to have the alternate versions of these songs to listen to...gosh, I'd buy an album of Harry scratching his warts if they released it! However, there's 'Harry' and there's 'APB'! One gives me thrills every time I hear it and the other makes me think of and ask just one word..."WHY?" (I am fully aware that many Nilsson fans would disagree if I place this album amongst my least favourites of Harry's - I know, from what they have told me, that it all depends on whether you 'learnt' these songs from the original albums (like me) or this album (like them). For someone who discovered these albums (albeit later than officially released) in chronological order I am SO glad I did!!! 'APB' was always an afterthought and deserves, in my opinion, to be regarded as little more. Harry WAS a revisionist...who knows how successful he might have been if this one album had been a true reflection of what he had previously passed as his best work?? ?